The countdown is on: from 11 to 15 June 2018 the doors will open for ACHEMA 2018 in Frankfurt. The international leading show for chemical engineering and the process industry takes place for the 32nd time. 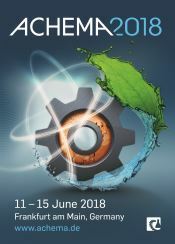 Achema is considered as innovations' platform and trend-setting meeting point. We exhibit in hall 5, booth B 8 and look forward to your visit!